And the same went for this one as well. This product serves the purpose of smoothing out the skin and making the canvas leveled and even. Often times our pores are large, we have acne scars and other issues with our skin that gives our skin less than a stellar feel but a primer such as this gives the skin an even, level canvas so that when you apply foundation, it'll apply much smoother and help your skin all the more flawless. It promises to "create the perfect base for your foundation," and "smooth skin texture for a silky flawless looking finish." Before tax, it was $4.49 and that was with the Sally's Beauty Supply Card, which anyone can apply for and get. It did just as it promised. I've tried other high-end primers and this is comparable to what they're selling. It felt amazing on the skin and dried quiet quickly. And the silky feeling it promised? It definitely delivered. 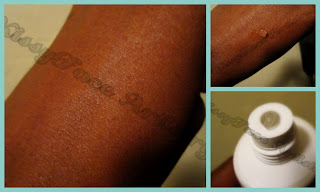 From the picture above you can see that it didn't leave a cast on the skin and it blended seamlessly into my skin. I definitely love it. I'm so glad that I came across it. I'm going to uploading another video on it in a bit and you'll see my only grip about it, but it's definitely KissyFace Approved despite that. Have an awesome day, lovelies!